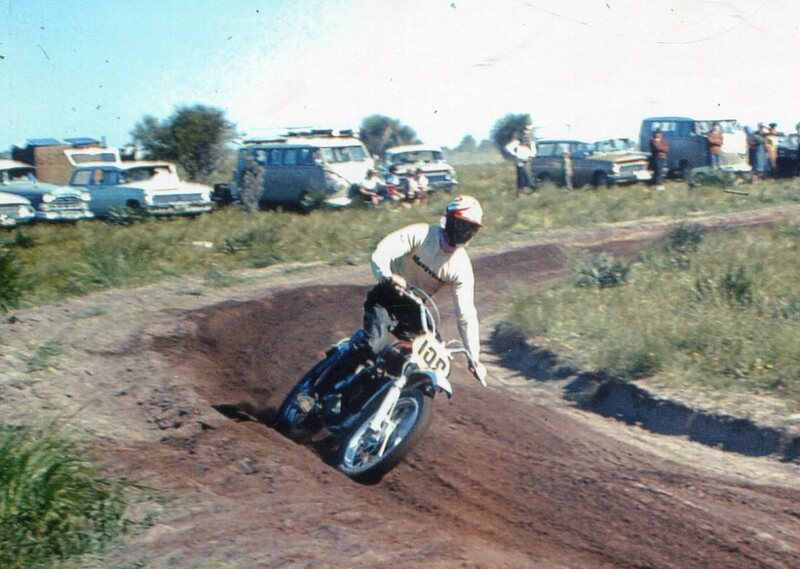 Over the years the club has raced at many different locations and in many different codes ﻿of competition. 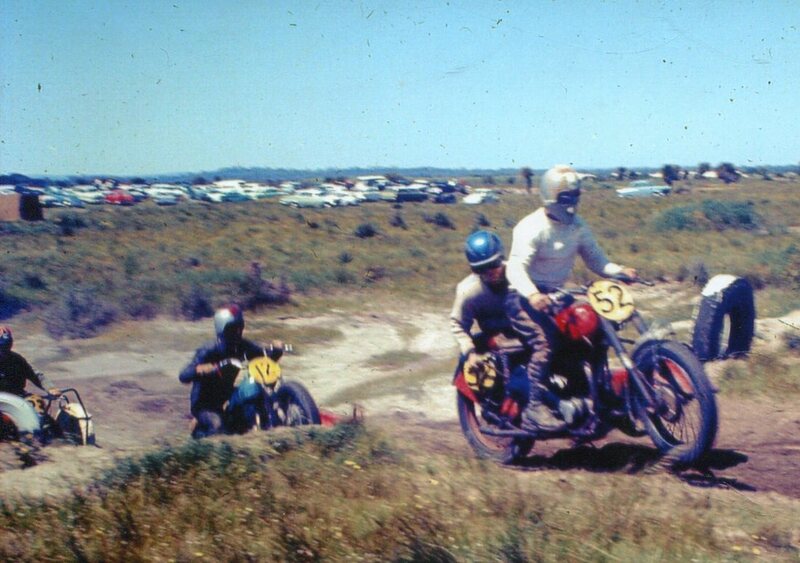 These race days became very popular as the track was right in town at the foot of the Mandurah bridge on the southern side, where the Port Mandurah Canals are now. 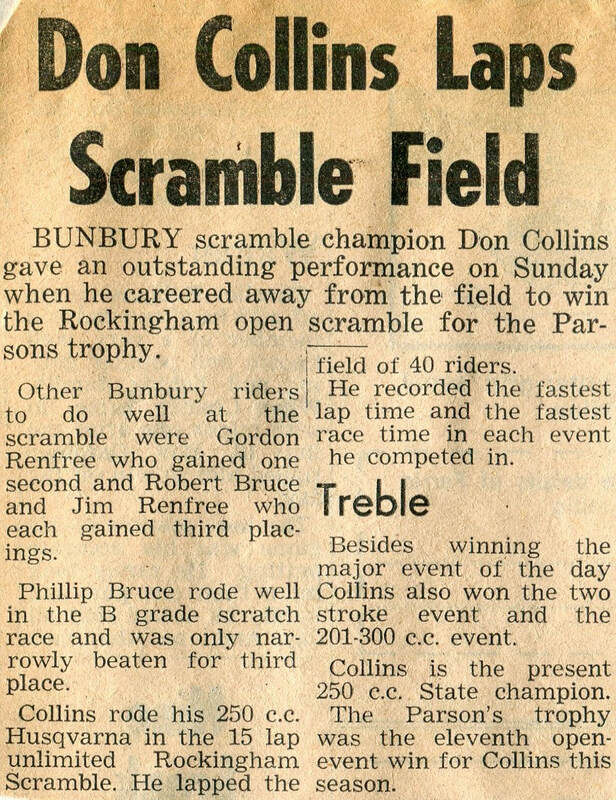 The police boys club were involved in the race day activities as a way to raise money for their local club, The collected entrance fees and set up stalls selling cool drinks and food to those who attended. 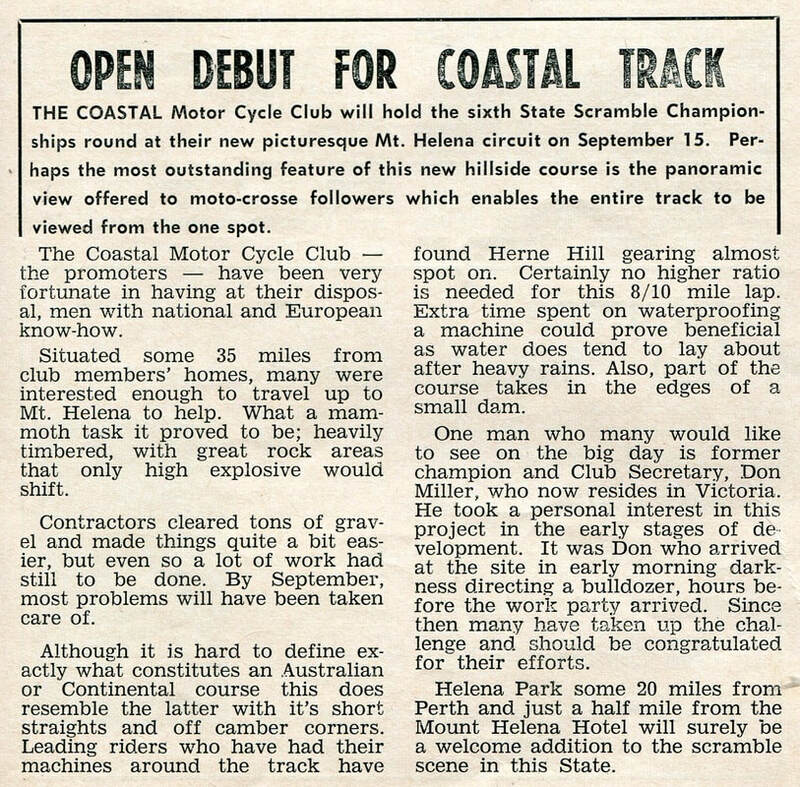 The result of it was the police boys club were able to raise enough money to build the Nancy Regan Hall, To celebrate the opening of the hall, The West Australian Gymnast team who were preparing for the Empire Games, (now Commonwealth Games) put on an exhibition in the hall. 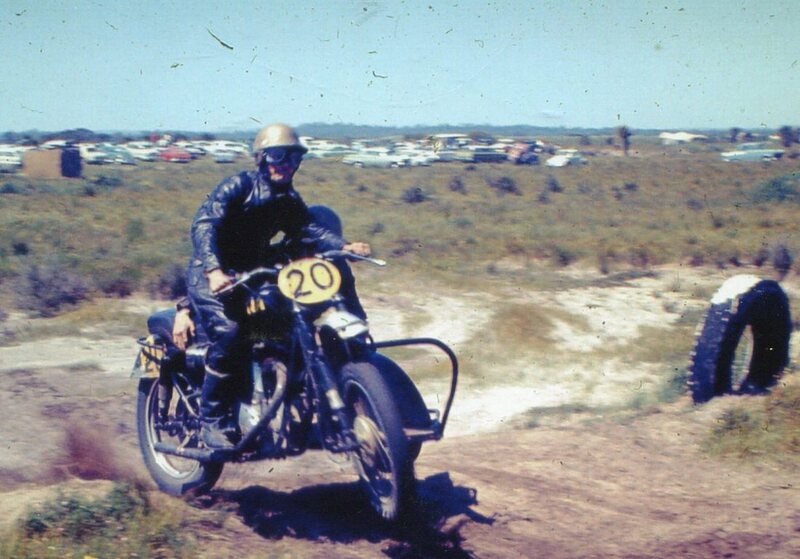 1961 - Don Collins and Gordon Renfree from the Bunbury Motor Cycle Club on a BSA. Photo: unknown. 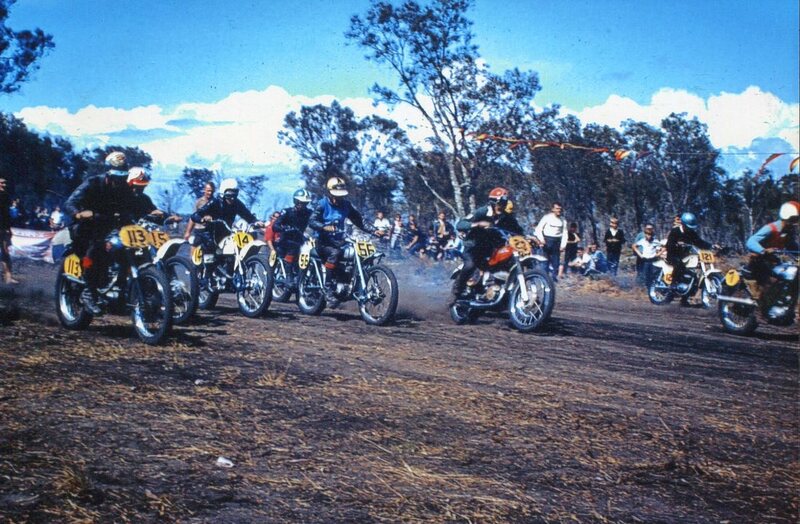 1968 - The start of a 250 scratch race at Suttons paddock. Photo: Tony Forsyth. 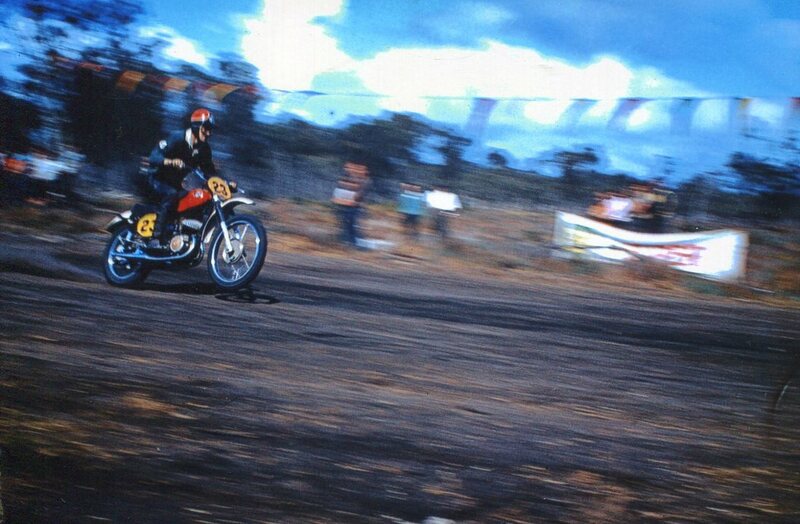 1968 - Bunbury rider Glen Britza at full noise. Photo: Tony Forsyth. 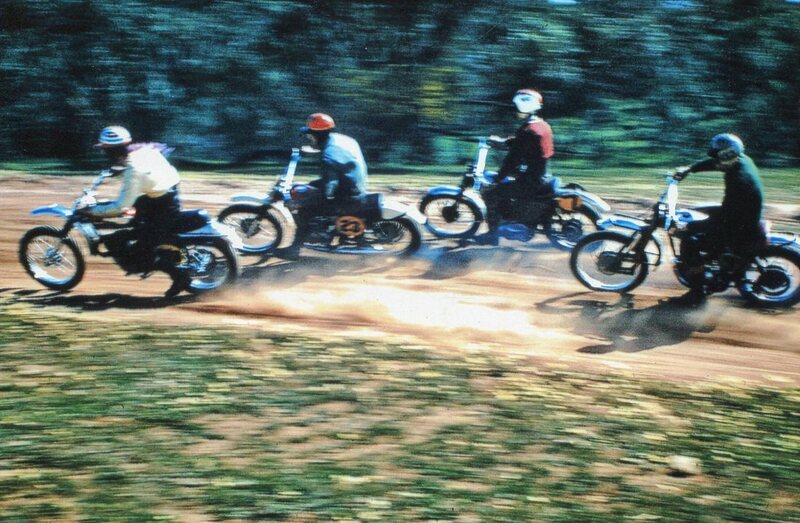 1967 - The Bunbury boys Don Collins on the Husqvarna leads Glen Britza on a CZ followed by John Mitchell on a BSA and Northam,s Ritchie Kings on a DOT. Photo: Tony Forsyth. 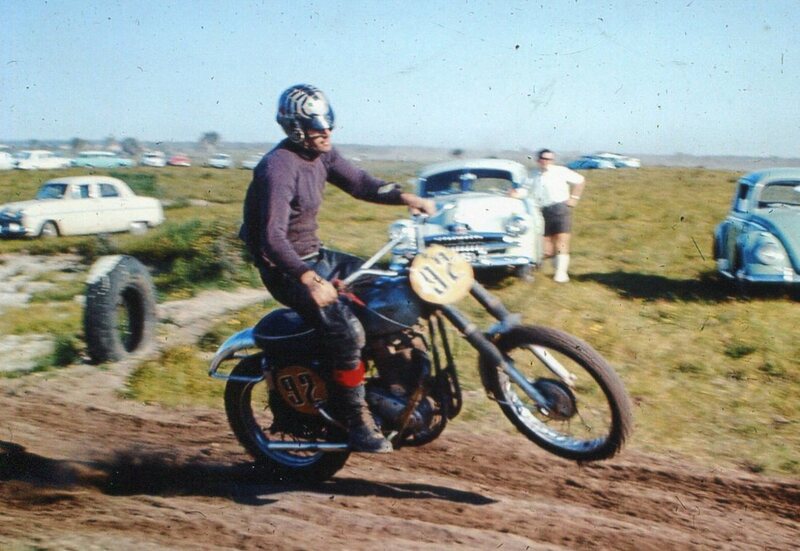 1967 - C Drummond on his 500 BSA. 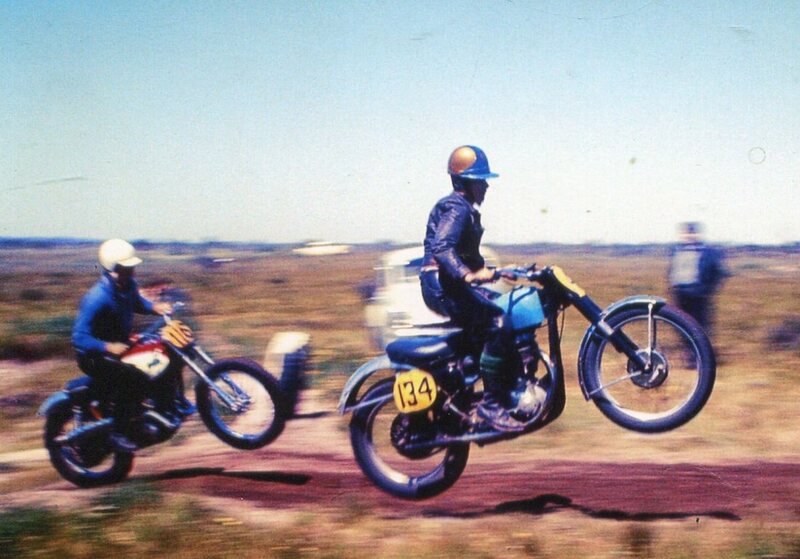 Photo: Tony Forsyth. 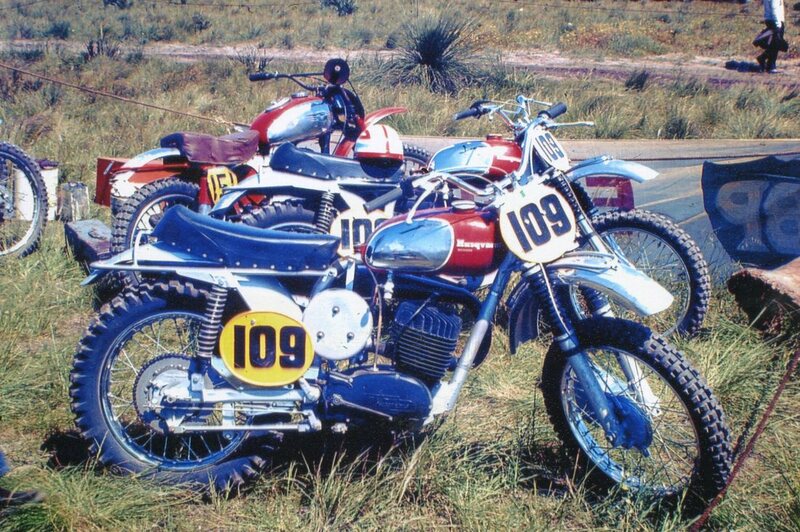 1968 - Bunbury's Don Collins 250 and 360 Husqvarna's. 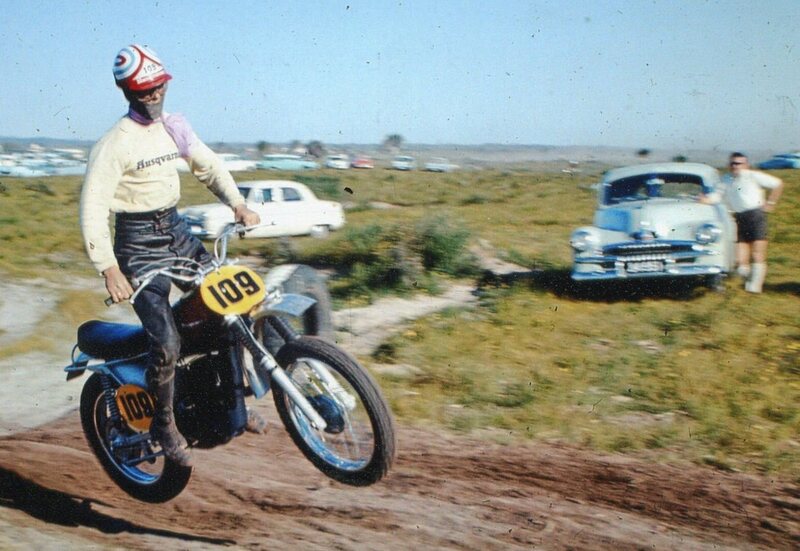 Photo: Tony Forsyth. 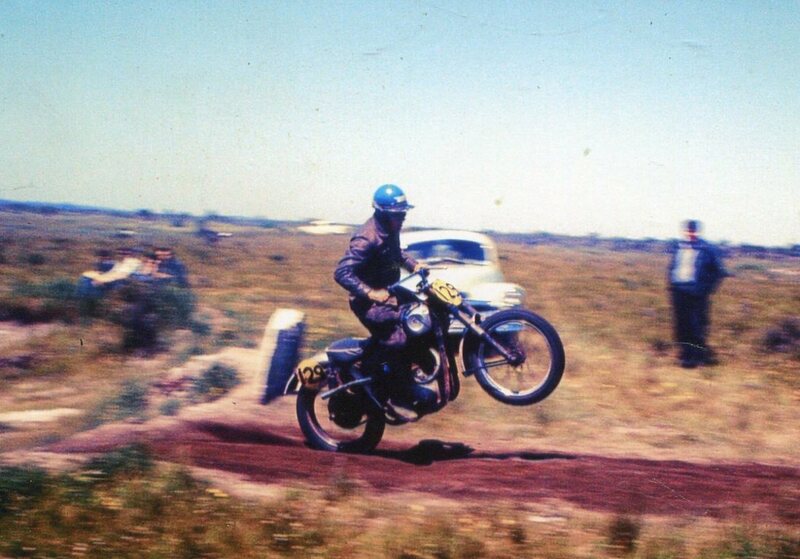 1968 - Don Collins number 109 from the Bunbury Motorcycle Club on his 250 Husqvarna. 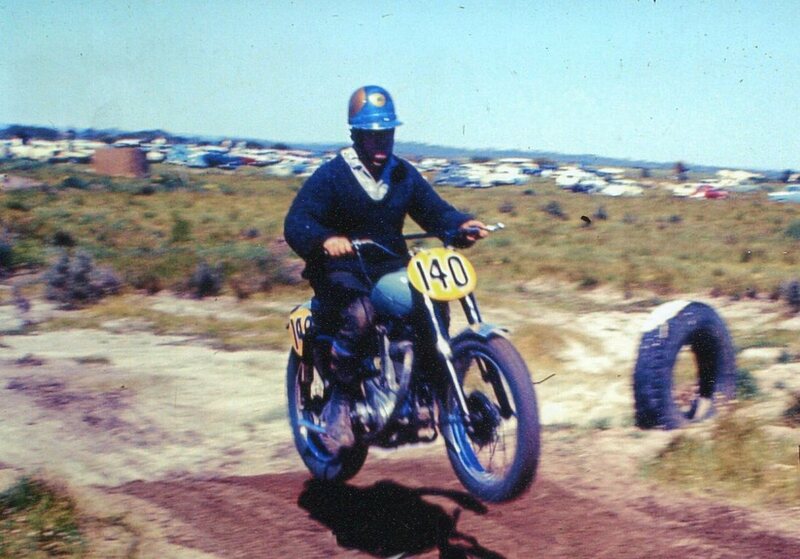 Photo: Tony Forsyth. 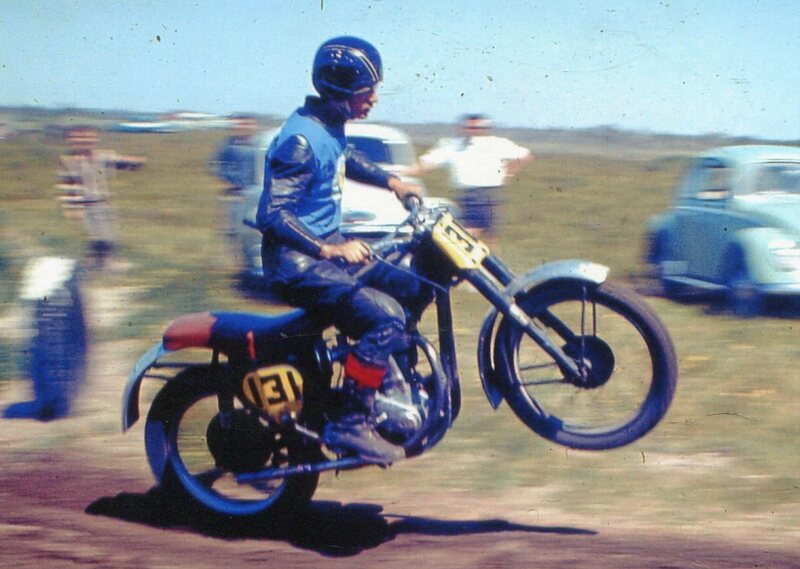 1968 - Kevin Russell on his 500 BSA at the Dixon Road track. Photo: Tony Forsyth. 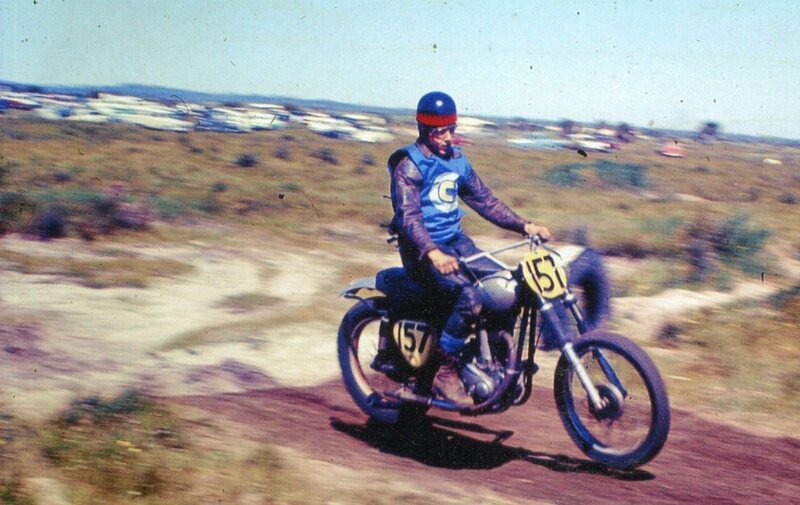 1968 - Richard Kings from the Northam Club on a 500 BSA. Photo: Tony Forsyth. 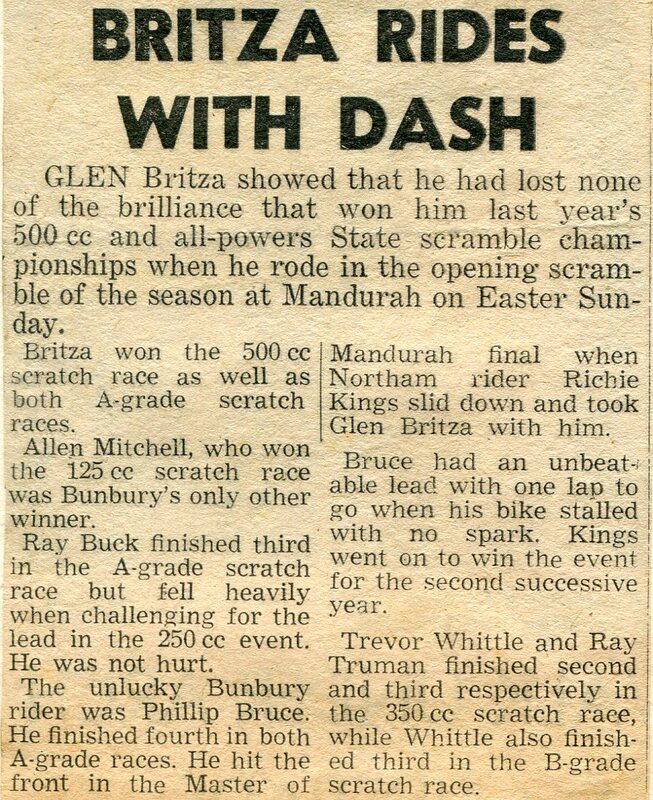 1968 - Glen Britza from the Bunbury Motor Cycle Club on his CZ always impressed. 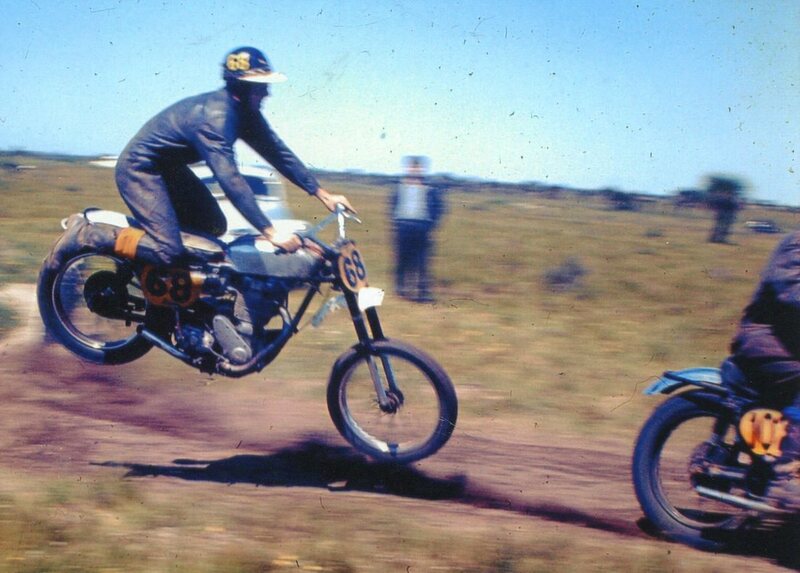 Photo's: Tony Forsyth. 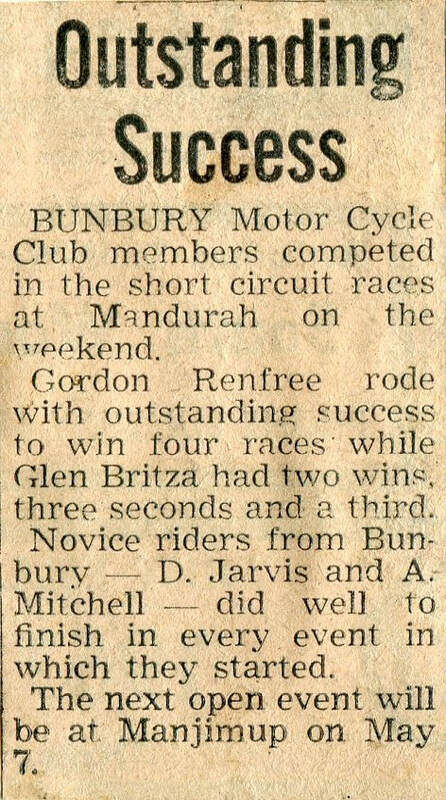 1968 - Gordon Renfree from Bunbury wheel stands his Greeves down the straight. 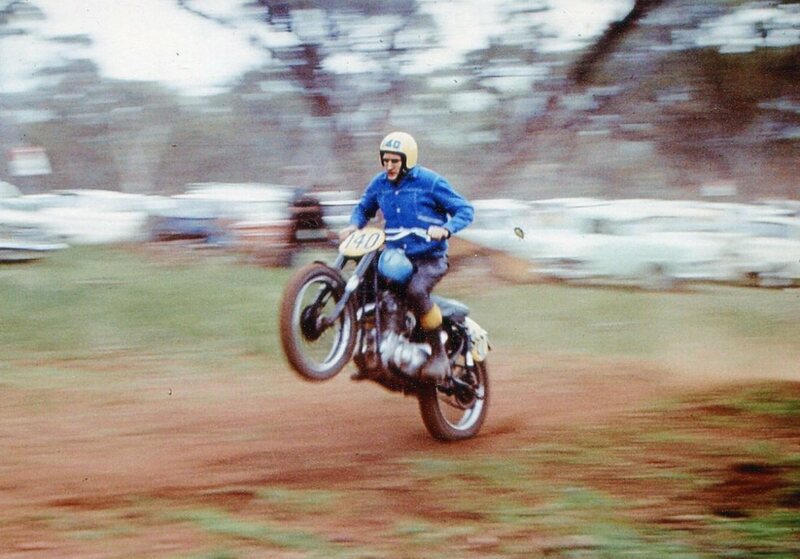 Photo: Tony Forsyth. 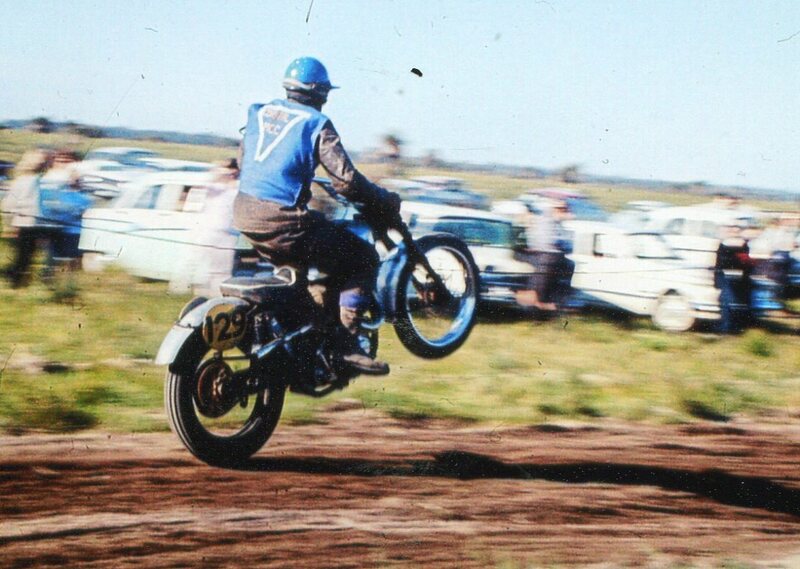 1968 - Photos: Tony Forsyth. 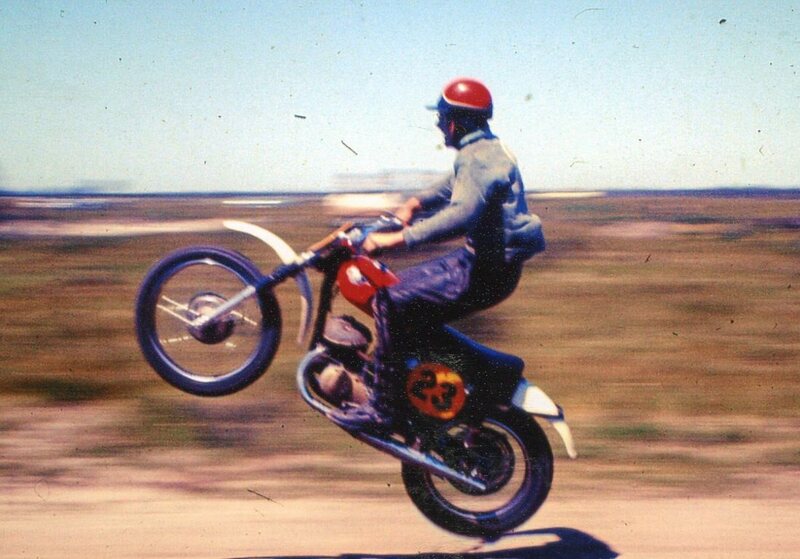 1968 - Photo: Tony Forsyth. 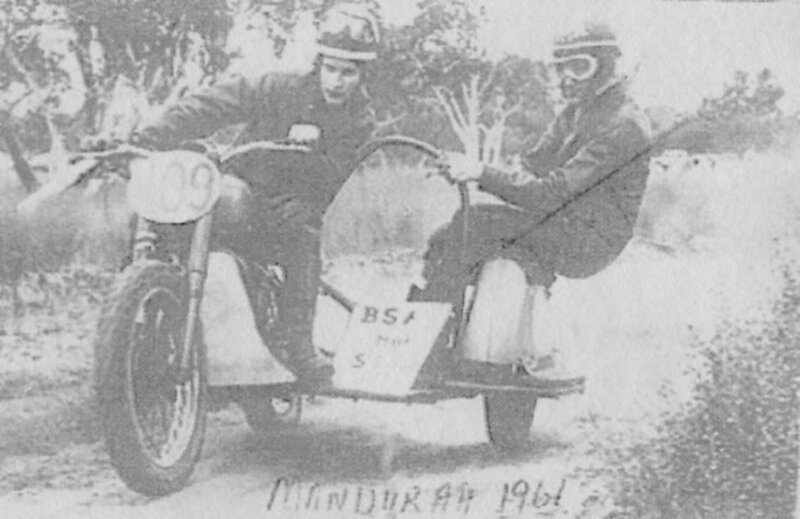 1968 - Farther and son sidecar team of Bill and John McDermott. 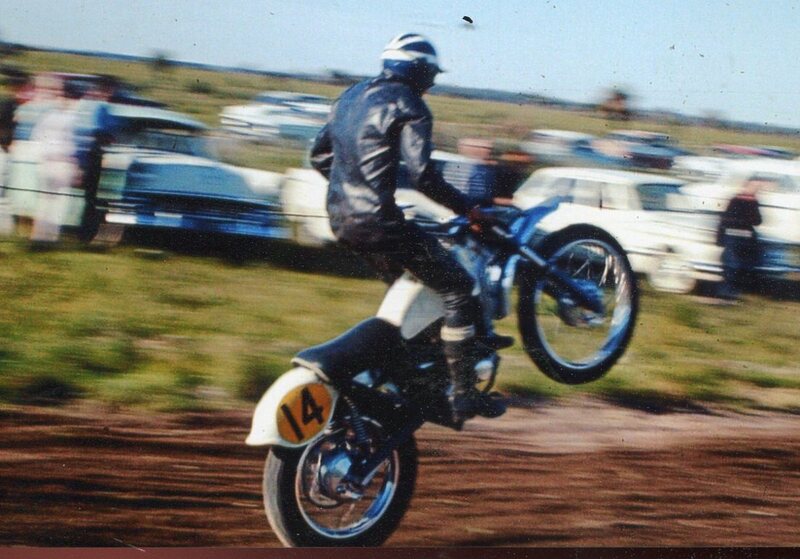 Photo: Tony Forsyth. 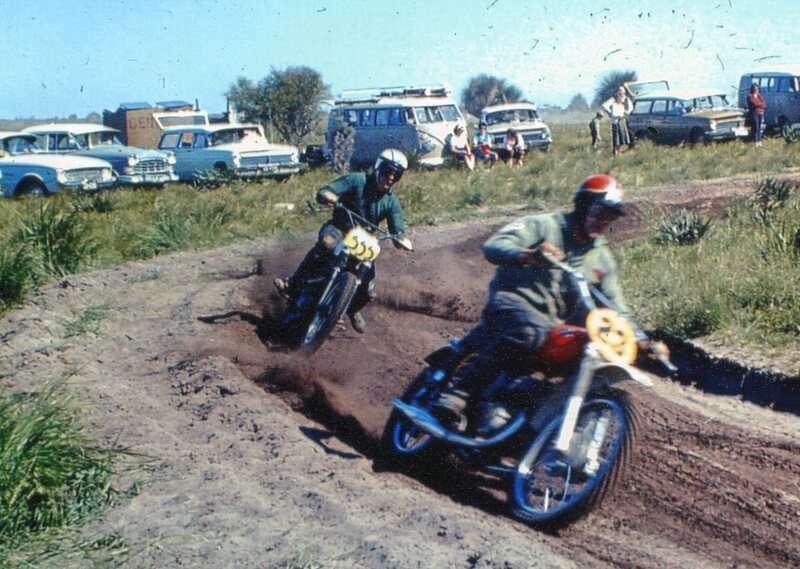 1968 - Warrick Lang and Barry Kennington on the 500 BSA outfit at the Dixon Road track. 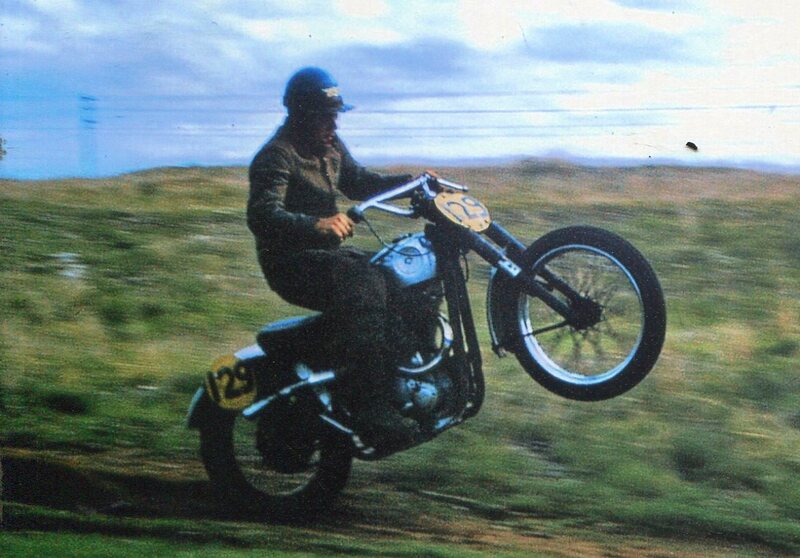 Photo: Tony Forsyth. 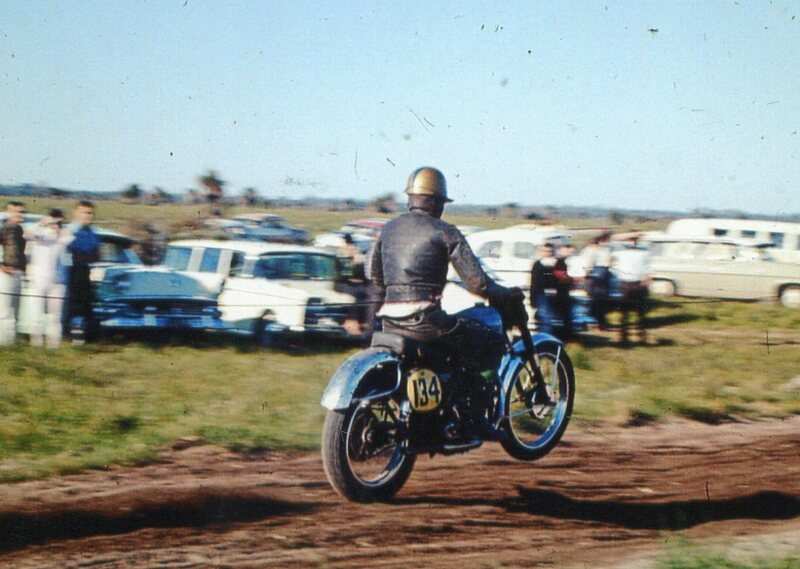 1968 - Stan Smith on the Ariel, Ray Withers on a Triumph who would loose his life at the Westralia track in Collie, on the number 23 machine is Glen Britza. Photo: Tony Forsyth. 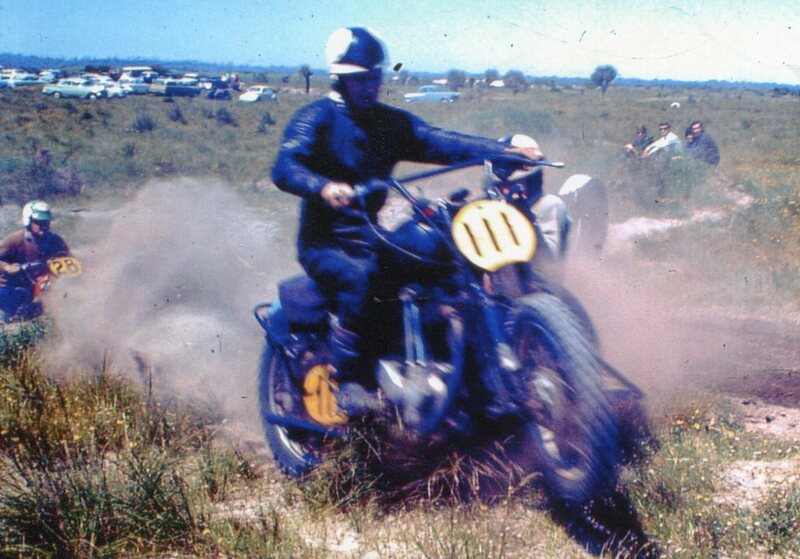 The Coastal Motor Cycle had its headquarters at Major Road Spearwood until it relocated to Henderson.